A gray whale heads north. Photo by Caitlin Scully. The northbound migration is in full swing! In the last few weeks, adult grays have begun moving north, away from their birthing and breeding lagoons on the Baja Peninsula, toward their feeding grounds in the Arctic. 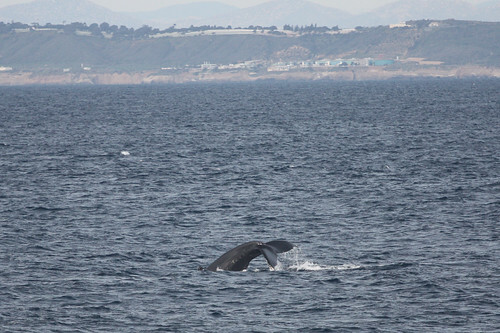 So far, the gray whales have been adults and juveniles – no mothers and calves yet. The whales have been very active and social while migrating north, a contrast to their behavior heading south. We have seen large groups of eight to 12 adults moving together, as well as many grays traveling in groups of two to four. Our passengers were elated to see the whales rolling, mating, spy-hopping, splashing, and breaching. Not only have we seen the grays interacting with other types of whales and dolphins, but they’ve also been traveling with them! Grays were seen traveling with a group of humpback whales, as well as interacting with pods of Risso’s dolphins, Pacific white-sided dolphins, and oceanic bottlenose dolphins. 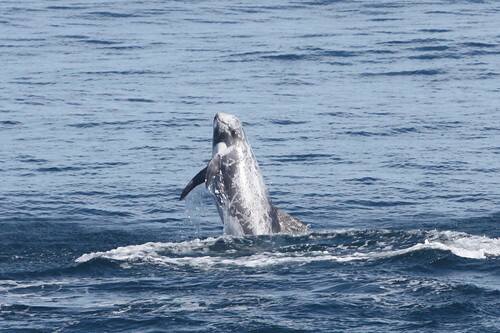 A Risso's dolphin breaches during a whale-watching excursion. Photo by Caitlin Scully. For the first time this season we have also seen groups of different types of dolphins interacting near our boat. On one exceptional day, both common dolphins and Pacific white-sided dolphins rode the bow wave of The Marietta simultaneously. One week we saw a large pod of Risso’s dolphins nearly every day. This group was made up of adults and juveniles and they were very active: jumping, flinging kelp in the air, and breaching. This is very unusual behavior for the usually stoic Risso’s. Whale watching ends April 4, so you have a few more weeks left to witness this amazing migration. We continue to vigilantly watch for the first mother and calf pair heading north. What does an aquarium curator do?